Silicon Valley-based TVU Network enjoyed a strong NAB 2018, spotlighting the launch of its MediaMind platform, a story-centric system that checked many of the boxes that were the rage at show: IP, AI, big data, and the cloud. MediaMind brings together many of the pieces of the TVU production process, including TVU Contribution Automation, TVU AI Engine, TVU Real Time Search Engine, TVU Workflow Engine. and TVU Producer Pro. It’s all part of an offering that company CEO Paul Shen refers to as Media 4.0. 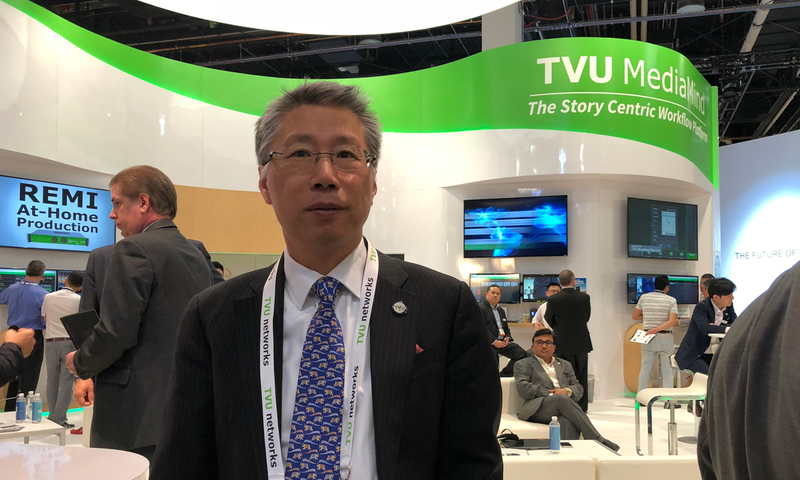 What he means is media’s move to “the automation, digitalization, and networking of design, production, information, communication and management processes.” We caught up with Shen at TVU Networks’ NAB 2018 booth to discuss the latest. What are the big highlights for you and your company at a show like NAB 2018? This show is not just about new products and new services. It’s about seeing the industry move forward into what we are calling “Media 4.0.” It’s the next phase of the media production process where automation and AI are going to have a significant impact. We have introduced Media Mind. Fundamentally, we want to move into a platform where we know exactly were all of the content is and know what that content is. We have enough metadata to describe the content to the frame lab. What we would like to see in the future is someone writing a script and the content can be produced. We have a lot of media companies supporting this, and we are aggressively pushing this to the industry. We’ve talked a lot about HEVC and how that’s grown. Are you seeing any notable steps forward in that regard here at this show? All of our products are HEVC-capable. We moved very fast. In fact, our HEVC-base pack has been shipping over a year and a half now. Another important part of this is that we always believe in a software-based encoder. The reason is, in the mobile environment, we believe the way that a software-based encoder behaves matches the mobile environment. One example is that the bitrate constantly changes. How quickly you can adapt to the bitrate change is incredibly important. Bandwidth availability is crucial. If you don’t react fast, you’ll be less efficient, or you will have packet loss. Our system can react to a bandwidth change request within a frame. So they perform very reliably. Did any trends or themes jump out to you at this year’s NAB Show? There has been a tremendous amount of interest in our TVU Grid. One of our sports clients is the Iceland government broadcast stations; when the soccer team is playing, they go live on the TVU Grid. Any of their partners can share that content. Today, we have more than 2,000 TV stations globally on the TVU Grid. This system can be tremendous for sports teams because it makes it easy to share their content with all of the local TV stations in their market. The media industry — sports, specifically — is changing so rapidly that it can be hard to keep up when releasing products or solutions as a tech vendor. What is about this industry that excites you? For a company that wants to continue to lead with technology, the change is what excites us. We understand the technology. We are not in a business of contributing commodity products. We are in this industry to lead. Give the industry new technology and help them change their business, because, if they don’t change, they die. That excites us.